Retire Your Ride recyclers are the guaranteed way to ensure your end-of-life vehicle (ELVs) is processed properly. Each vehicle goes through a methodical process to maximize reclamation and minimize environmental impact. They have invested in the training and equipment to ensure each and every vehicle is handled in an environmentally responsible manner. They have been all been audited by an independent third party to ensure that their practices, facilities and training meet the requirements of the Canadian Automotive Recyclers’ Environmental Code. Your car is the largest and most recyclable product you own. No sorting required – the recyclers that work with Retire Your Ride will reuse and recycle 80% of your vehicle and will make sure the remaining materials are disposed of responsibly. Once the fluids and other materials have been removed, they are re-used or responsibly disposed of. Removed to a licensed recycling facility or used for energy recovery in approved used oil furnaces where allowed. Re-used by the auto recycler, sold to their customers or removed to a licensed recycling facility. All air-conditioning systems are evacuated by a trained, licensed technician. The used refrigerant is re-used onsite or sold to a licensed buyer for re-use or removed by a licensed recycling facility. Punctured, drained and recycled for the metals and increasingly recycled for its plastic content. This component is either re-sold or removed by a licensed recycling facility. Removed and collected and sent to Summerhill Impact’s Switch Out Program www.switchout.ca for mercury recovery and storage. Good quality tires are sold domestically or exported. All provinces now have a scrap tire stewardship program to properly manage tires and create value added end products. Depending on their condition and sales potential, parts and components are dismantled, reconditioned and sold to customers. This minimizes the need for manufacturing new parts. Parts which are commonly re-used include engines, transmissions, whole front and back ends, body panels, and wheels. Once all the fluids have been drained and the re-usable parts have been removed, the automotive recycler employs the services of an automobile crusher to flatten the vehicle hulk. These flattened hulks are shipped to shredders which pulverize the car into fist-sized pieces in minutes. The valuable ferrous and non-ferrous metals are removed magnetically, and with complex floatation systems. The non-metallic components, known as Auto Shredder Residue (ASR) or fluff, are landfilled. ASR is composed of rubber, plastics, fabric, dirt, foam, glass and metal particles. 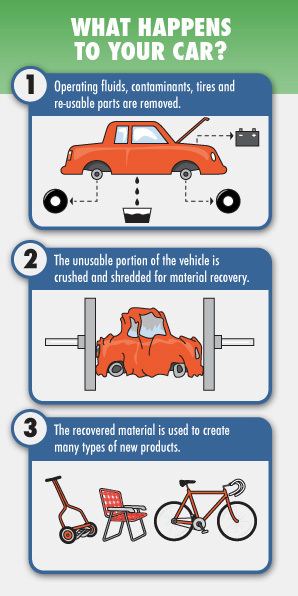 That is why it is critical to ensure that the hazardous components are recovered before the car is crushed and shredded. Research continues to determine ways to reduce the amount of ASR diverted to landfills, both at the manufacturing and recycling stages in the life of a vehicle.